8 days from £1753pp plus international flights. There is a lot to see and do in Bhutan and if you want to do a little bit of everything in about a week then this is the trip for you. We've put together some of the very best bits of cultural sightseeing together with the some more adventurous activities that allow you to make the most of this wonderful Himalayan landscape. So not only do you get to walk to the world famous Tiger's Nest monastery and see the fabulous architecture of the Dzong at Punakha, but you also have some walking, white water rafting and some downhill mountain biking. 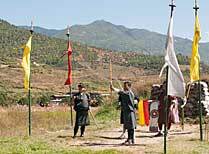 You have a guide with you for the whole of your journey in Bhutan for this private tailor-made holiday and you can take this tour at any time that suits you. We've priced this trip using a range of standard hotels. If you want to splash out and upgrade to something more luxurious there are also some pretty amazing places to stay here - just let us know and we'll give you the options. 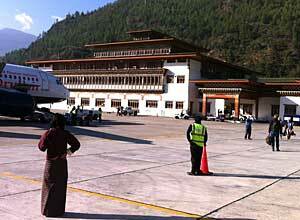 After the spectacular flight over the Himalayas, you will be met at Paro airport and driven to Thimpu, the capital, a journey of about an hour. You'll stop at Chuzom where the Paro and Thimpu rivers meet and at Buddha Point to admire views of the Thimpu valley, before checking in to your hotel. In the afternoon you have a guided city tour, visiting the Chorten built to commemorate the third king and the Trashichhoedzong, an imposing 17th century fortress. 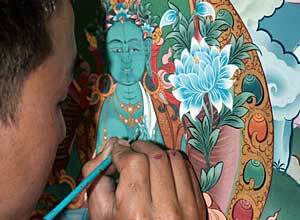 You will have time to visit the craft bazaar where you can buy Bhutanese arts and crafts. Stretch your legs this morning with a walk through colourful rhododendron forests. After an hour or so you will reach Tango Goemba which was built in the 15th century by the 'Divine Madman', Lama Drukpa Kuenley. In the afternoon you will tour the National Library with its large collection of priceless Buddhist manuscripts, and the Institute for Zorig Chusum, or painting school, to see the skills of the students at first hand. 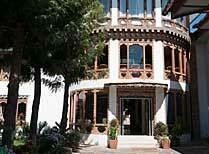 Then it's a visit to the Textile Museum and Simply Bhutan, a project which conserves traditional culture and provides employment for the young. Following an early breakfast you depart for Punakha. This is about a 3 hour drive. The route crosses Dochu-la Pass at 3,088m. Clear skies permitting, you should see several impressive Himalayan peaks including Gangkar Puensum, the highest mountain in Bhutan at 7,497m. Next you have a 3-4 hour walk to Lungchuzekha Goemba. This is quite a climb, but you will be rewarded with wonderful views. After lunch in the forest the drive continues to Chimi Lhakhang, a temple dedicated to the Divine Madman and credited with powers of fertility. 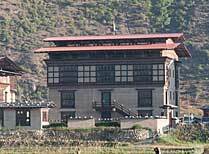 Arrive at your hotel in Punakha in the evening. 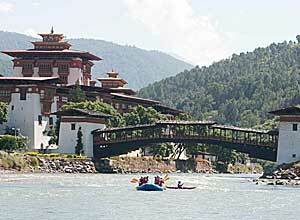 This morning you will visit Punakha Dzong located at the confluence of the Pho Chhu and Mo Chhu rivers. Over the years the building has been damaged by fire and earthquake but has been fully restored to its former glory in recent years and is probably the nicest dzong in Bhutan. Now for your rafting adventure! This is fairly gentle rafting and suitable for people who have never tried it before. You head downstream on the Pho Chhu river for about 16kms, through 15 sets of class 2-4 rapids. Catching your breath, you will see beautiful alpine scenery and plenty of rare birds. After this thrilling ride you will be driven back to your hotel in Punakha. 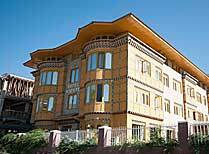 Today you travel back to Paro, about a 4 hour drive, stopping en route at Simtokha Dzong, the headquarters for The Institute for Language and Cultural Studies. Look out for the the 300 plus ornate slate carvings behind the prayer wheels in the courtyard. At Paro check in to your hotel. later you'll explore the town with your guide, visiting Ta Dzong, the National Museum, which has an extensive collection of artworks and historic artefacts. 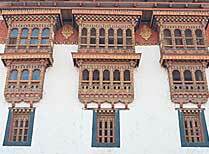 You will also visit Rinpung Dzong with its fine wall paintings depicting Buddhist themes. 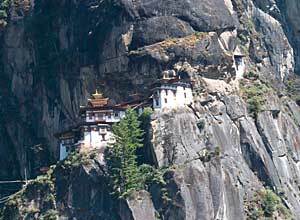 Today you have the chance to trek to Taktsang or Tigers Nest Monastery, the most photographed site in Bhutan, dramatically perched on the side of a cliff 900m above the valley. The hike takes 5-6 hours and culminates in the 300 steps to the entrance. You will have time to look round the buildings before retracing your steps to the cafe for lunch then returning to Paro. 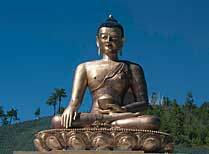 Later this afternoon you will drive to Drukgyel Dzong, a striking ruined fortress, and Kyichu Lhakhang which dates back to the 7th century and marks the introduction of Buddhism to Bhutan. 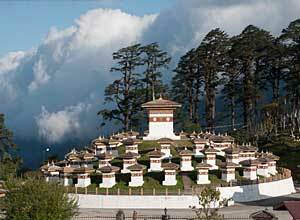 This morning you will be driven about an hour to Chele La (pass), at 3,988m, one of the highest road passes in Bhutan. 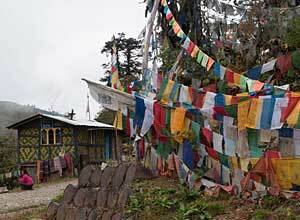 See hundreds of prayer flags fluttering in the wind and fantastic mountain views beyond. 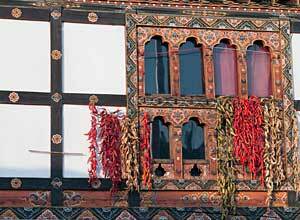 You will descend to the Paro Valley by mountain bike down a paved, winding road. This is sure to be a thrilling ride as you descend from 3,988m to 2,200m. 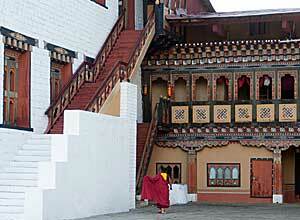 Later you can explore Paro by bike and return to the hotel. Breakfast, lunch, dinner. After breakfast you will be taken to the airport for your flight home. Departure dates: This is a private tailor-made holiday which you can take at any time to suit you.